When you lose a tooth, you may want to consider getting a dental implant to replace it. The implant is surgically placed underneath your gums and into your jawbone. It will function as the root of your replacement tooth and will take about 2 to 6 months for the implant to fully fuse with your jawbone. 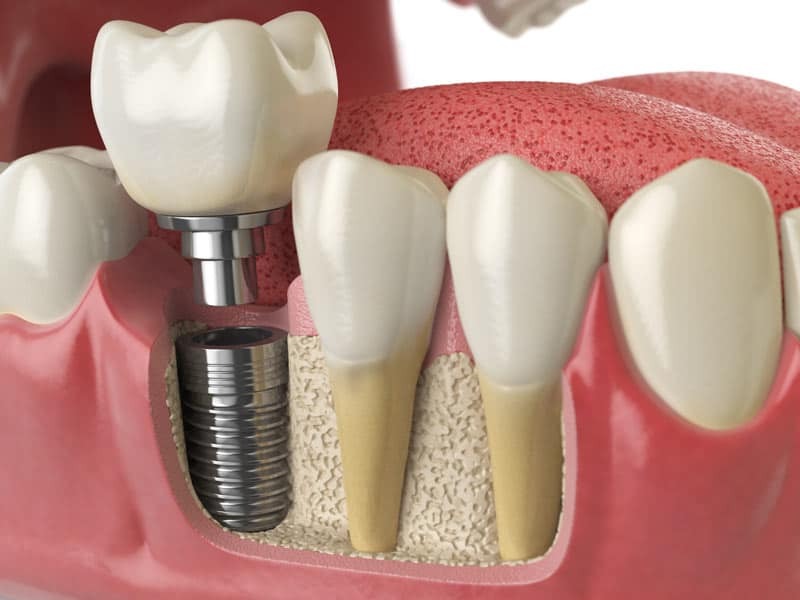 Once it has fused with the jawbone, a replacement tooth (crown) will be attached to the implant. An implant is extremely stable, as it is fused to the bone. It’s not like dentures that may accidentally dislodge while you eat or speak. It can last for the rest of your life. In fact, the first dental implant ever installed outlived the patient. The installation of the implant doesn’t require any reduction in structure/material to the adjacent teeth (which is what happens when you get a dental bridge). It feels natural and over time, you’ll likely forget that you have an artificial tooth. When you have a row of missing teeth, an implant supported bridge may be recommended.